A series of major breaking stories captured the attention of both the public and the media in 2010, while news about the nation’s struggling economy consistently attracted high levels of public interest and coverage throughout the year. Each week, the Pew Research Center for the People & the Press conducts national public opinion surveys to measure which news subjects are receiving the most public attention, while the Pew Research Center’s Project for Excellence in Journalism analyzes news coverage. For an analysis of the year’s news coverage, see “The Year in News 2010: Disaster, Economic Anxiety, but Little Interest in War” released January 11, 2011. In most cases, the public and news media’s priorities were in sync. At their peak intensity, each of these stories filled over 40% of the week’s newshole, according to PEJ’s News Coverage Index, and was the most closely followed story that week by more than 40% – and in several instances about 60% – of the public, according the Pew Research Center’s News Interest Index. But there were moments, and stories, when the public’s interests diverged substantially from the press’ coverage. And those discrepancies, moreover, tended to fit a broader pattern. In general, the public tended to maintain its interest in major breaking news stories considerably longer than the press did. 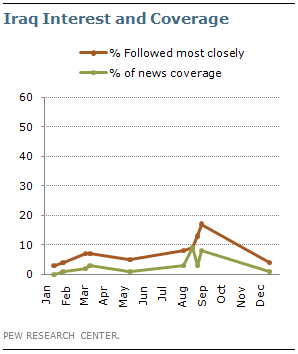 And the press tended to maintain substantially more interest in Washington Beltway controversies than did its audience. Most notably, in the weeks following three of these major news events – the Haiti disaster, the passage of health care legislation, and the capping of the gulf oil spill – public interest remained high long after the news media’s focus had turned elsewhere. 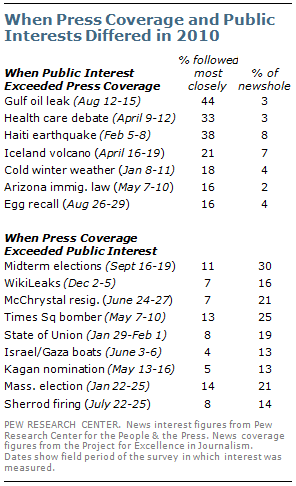 And while public interest in the 2010 midterm elections was on par with press coverage in the final stages of the campaign season, coverage far exceeded public interest earlier in the campaign cycle. Over the course of 2010, seven of nine cases in which coverage far exceeded public interest involved stories that had far greater resonance inside the Beltway than outside. These included the firing of General Stanley McChrystal, the release by WikiLeaks of classified State Department documents, Scott Brown’s winning the Massachusetts Senate seat in a special election, and the firing of Shirley Sherrod, a former U.S. agriculture department employee. Notably, several of these stories involved the media itself. These included: McChrystal and his staff’s being quoted criticizing the administration in Rolling Stone magazine, WikiLeaks raising questions about press responsibilities, and video of Sherrod being shown repeatedly out of its full context after being picked up from a conservative website. One story where the public and the media were often in sync was the economy. 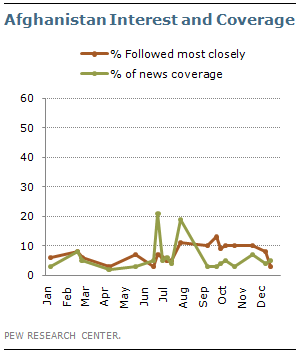 Coverage of economic news was consistently high from week to week and cumulatively represented the single largest story over the course of 2010. Public interest was also notably consistent. In every week public interest in economic news was measured, at least 30% of Americans said they were following reports about the condition of the economy very closely, and, aside from periods of peak interest in Haiti, the health care debate and the Gulf oil spill, at least 10% said the economy was the story they were following more closely than any other. Economic news received the most or second most public attention in 32 of the 45 weeks in which public attention to the topic was tracked. While the economy topped the news over the course of the whole year, 2010 was marked by a series of other major stories that received overwhelming levels of news coverage and public interest as well. The year began with a devastating earthquake in Haiti, followed by end game in the fight over sweeping health care legislation, the oil spill in the Gulf of Mexico, and the Republicans’ victories in the midterm elections. At their peak, each of these stories dominated press coverage – accounting for more than 40% of the newshole in a single week. And at these moments, public interest was commensurately high. Fully 66% of Americans said they were following the debate over health care more closely than any other news the week of March 22-28, and 63% were focused on the oil spill in the Gulf of Mexico the week of June 14-20. Immediately following the earthquake in Haiti, 57% of Americans followed news about the aftermath more closely than any other story, and in the week following the 2010 midterms, 43% of Americans said that was their top news interest. While press and public interests coincided at these peak moments, the news media and public did not concur continuously about the importance of these news stories. Most importantly, the public stayed focused on three of these stories – the disaster in Haiti, health care reform and the gulf oil spill – long after media attention had shifted to other emerging stories. Just three weeks after the most intense focus on the Haiti earthquake, coverage of the aftermath comprised just 8% of the newshole, replaced by press coverage of the economy and possible problems with Toyota vehicles. Yet the public continued to report more interest in news about the earthquake’s aftermath than either of these other topics – 38% said they were following news about Haiti more closely than anything else. Similarly, less than a month after the July 15th capping of the Deepwater Horizon oil spill on the floor of the Gulf of Mexico, 44% of Americans continued to say they were following news about the spill and its aftermath more closely than any other topic. 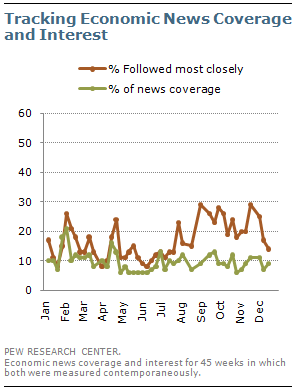 Yet just 3% of news coverage focused on the spill’s aftermath, as the press focus had turned toward the upcoming midterm elections. And within three weeks of President Obama signing major new health care legislation, the issue filled just 3% of news coverage; there was more coverage of a major mining accident in West Virginia, Obama’s push to place greater controls on the world’s nuclear weapons and Tiger Woods’ return to the PGA. Yet 33% of Americans said they were most interested in news about the new health care law, far more than any of these other stories. Americans (7%) said they followed the news about McChrystal most closely that week. Instead, 53% of Americans were still focused mostly on developments in the Gulf of Mexico. The week of July 19, the media jumped on a story about the USDA firing an African American official for allegedly making racist comments in a speech. The department quickly changed course, offering Shirley Sherrod her job back, when it became clear her comments had been taken out of context. The story accounted for 14% of the newshole (33% on cable news channels), but just 8% of the public said this was the news they were following most closely. 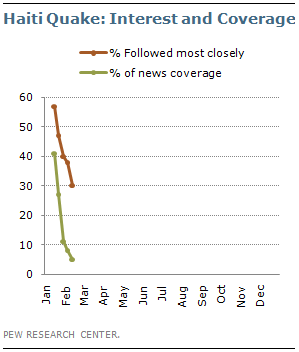 That week, half the public (51%) said they were following news about the Gulf oil spill most closely. 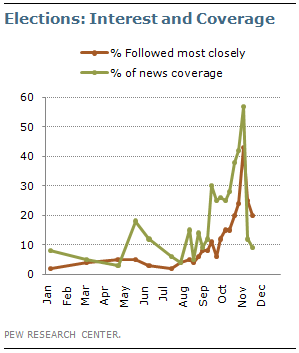 Similarly, the political drama of the 2010 midterm elections often drew far more press than public attention. Though the public eventually took a strong interest in the Nov. 2 midterm elections in late October, there were instances earlier in 2010 in which coverage of the primaries significantly outweighed interest. During the week starting Sept. 13, the media devoted 30% of the newshole to election news (42% for cable news channels) – including Christine O’Donnell’s surprise win in the Delaware Republican Senate primary. That week, 11% of the public said they followed election news most closely, while more than twice as many (26%) rated news about the economy as most important to them. This gap between public interest and press coverage continued through September and October, as the election consumed over a quarter of the newshole, but was a second, or even third-tier story in terms of public interest. The elections did not become the top story for the public until the final week before Election Day, and remained the top story for the two weeks following. The ongoing U.S. military efforts in Afghanistan and Iraq received modest press coverage and public attention over the course of 2010. Aside from spikes in press coverage related to Afghanistan surrounding General McChrystal’s resignation in June and the WikiLeaks release of secret military documents in August, events in Afghanistan and Afghanistan policy received modest press coverage in 2010 – 4% of the news measured by the Project for Excellence in Journalism. Across 18 weeks in which public interest on the topic was measured, roughly a quarter said they were following Afghanistan-related news “very closely”. But Afghanistan was the top news story for fewer than one-in-ten Americans in virtually all of those weeks. Similarly, over the entire course of 2010 1% of news coverage was devoted to Iraq events and policy debates, and in no week did Iraq consume more than 10% of the newshole. Public interest in Iraq news was also modest – in the ten weeks in which public interest in Iraq-related news was tested, roughly a quarter of Americans said they were following “very closely”, but about one-in-ten rated it as the top story they followed most closely. The exception to this came in early September, when 17% said they were following news about the withdrawal of U.S. troops from Iraq more closely than any other story. 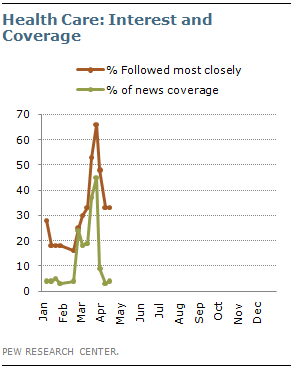 The graphic below plots out the interest and coverage levels for many top weekly stories of the year. For long-running stories, such as the economy or the Gulf oil spill, the numbers have been averaged and are represented by larger square dots. The bold diagonal line represents the typical relationship between coverage and interest across the entire year’s worth of weekly measurements (as defined by a simple regression analysis). 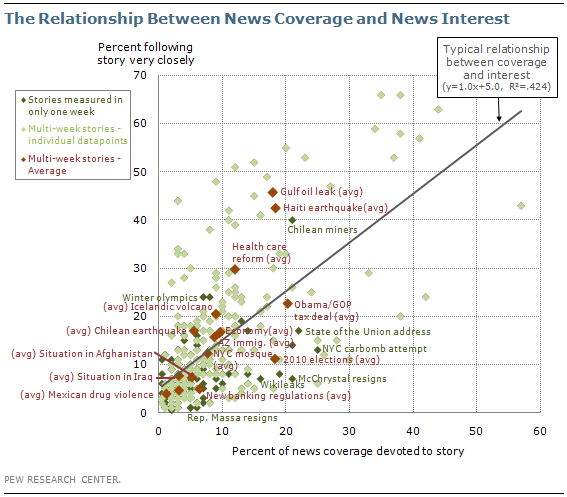 Data points above the diagonal line represent stories in which public interest was high relative to the amount of press coverage. 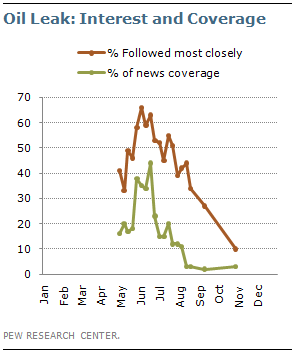 Those points below the line show stories in which press coverage was high relative to the amount of public interest. In both directions, the farther a story is from the line, the greater the gap between interest and coverage. The News Interest Index is a weekly survey conducted by the Pew Research Center for the People & the Press aimed at gauging the public’s interest in and reaction to major news events. This project has been undertaken in conjunction with the Project for Excellence in Journalism’s News Coverage Index, an ongoing content analysis of the news. The News Coverage Index catalogues the news from top news organizations across five major sectors of the media: newspapers, network television, cable television, radio and the internet. Each week (from Monday through Sunday) PEJ compiles this data to identify the top stories for the week. (For more information about the Project for Excellence in Journalism’s News Coverage Index, go to www.journalism.org.) The News Interest Index survey collects data from Thursday through Sunday to gauge public interest in the most covered stories of the week. Results for the weekly surveys are based on landline telephone and cell phone interviews conducted under the direction of Princeton Survey Research Associates International among a national sample of approximately 1,000 adults living in the continental United States, 18 years of age or older. Both the landline and cell phone samples were provided by Survey Sampling International. Interviews were conducted in English. The combined landline and cell phone sample are weighted using an iterative technique that matches gender, age, education, race, Hispanic origin, region, and population density to parameters from the March 2009 Census Bureau’s Current Population Survey. The sample is also weighted to match current patterns of telephone status based on extrapolations from the 2009 National Health Interview Survey. The weighting procedure also accounts for the fact that respondents with both landline and cell phones have a greater probability of being included in the combined sample and adjusts for household size within the landline sample. Sampling errors and statistical tests of significance take into account the effect of weighting.